A multi-value metrics aggregation that calculates one or more percentiles over numeric values extracted from the aggregated documents. These values can be extracted either from specific numeric fields in the documents, or be generated by a provided script. Percentiles show the point at which a certain percentage of observed values occur. For example, the 95th percentile is the value which is greater than 95% of the observed values. Percentiles are often used to find outliers. In normal distributions, the 0.13th and 99.87th percentiles represents three standard deviations from the mean. Any data which falls outside three standard deviations is often considered an anomaly. When a range of percentiles are retrieved, they can be used to estimate the data distribution and determine if the data is skewed, bimodal, etc. Assume your data consists of website load times. The average and median load times are not overly useful to an administrator. The max may be interesting, but it can be easily skewed by a single slow response. As you can see, the aggregation will return a calculated value for each percentile in the default range. If we assume response times are in milliseconds, it is immediately obvious that the webpage normally loads in 10-725ms, but occasionally spikes to 945-985ms. There are many different algorithms to calculate percentiles. The naive implementation simply stores all the values in a sorted array. To find the 50th percentile, you simply find the value that is at my_array[count(my_array) * 0.5]. Clearly, the naive implementation does not scale — the sorted array grows linearly with the number of values in your dataset. 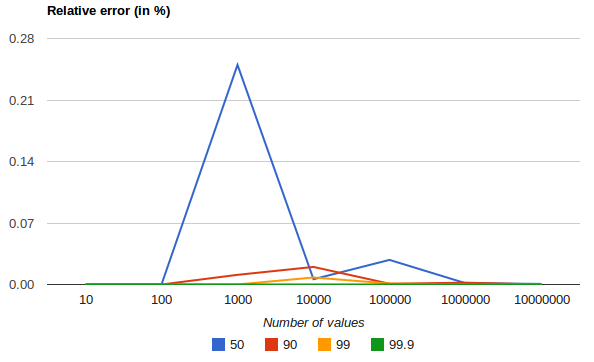 To calculate percentiles across potentially billions of values in an Elasticsearch cluster, approximate percentiles are calculated. The algorithm used by the percentile metric is called TDigest (introduced by Ted Dunning in Computing Accurate Quantiles using T-Digests). For small sets of values, percentiles are highly accurate (and potentially 100% accurate if the data is small enough). It shows how precision is better for extreme percentiles. The reason why error diminishes for large number of values is that the law of large numbers makes the distribution of values more and more uniform and the t-digest tree can do a better job at summarizing it. It would not be the case on more skewed distributions. The TDigest algorithm uses a number of "nodes" to approximate percentiles — the more nodes available, the higher the accuracy (and large memory footprint) proportional to the volume of data. The compression parameter limits the maximum number of nodes to 20 * compression. Therefore, by increasing the compression value, you can increase the accuracy of your percentiles at the cost of more memory. Larger compression values also make the algorithm slower since the underlying tree data structure grows in size, resulting in more expensive operations. The default compression value is 100. A "node" uses roughly 32 bytes of memory, so under worst-case scenarios (large amount of data which arrives sorted and in-order) the default settings will produce a TDigest roughly 64KB in size. In practice data tends to be more random and the TDigest will use less memory. HDR Histogram (High Dynamic Range Histogram) is an alternative implementation that can be useful when calculating percentiles for latency measurements as it can be faster than the t-digest implementation with the trade-off of a larger memory footprint. This implementation maintains a fixed worse-case percentage error (specified as a number of significant digits). This means that if data is recorded with values from 1 microsecond up to 1 hour (3,600,000,000 microseconds) in a histogram set to 3 significant digits, it will maintain a value resolution of 1 microsecond for values up to 1 millisecond and 3.6 seconds (or better) for the maximum tracked value (1 hour).